it would look like ! Necklace is finished with a the perfect timing as it is Chinese New Year : there were some celebrations in Chinatown in Paris, so we took the necklace there to take some pictures. We have 2 Chinatown in Paris, the big one is located in the XIII th area, and the second one, much smaller, is at Belleville subway station, that is where we went today. Place de l'Hotel de Ville in the center this evening, where a party and folkloric dances should take place ! Here are some pictures of the event...and the Chinese dragon necklace ! You can click on each picture to enlarge them..
Little Chinatown is located at the bottom of 'rue de Belleville', which is a very long street, going up a hill. Getting married today is certainly a good luck for the newly wed ! 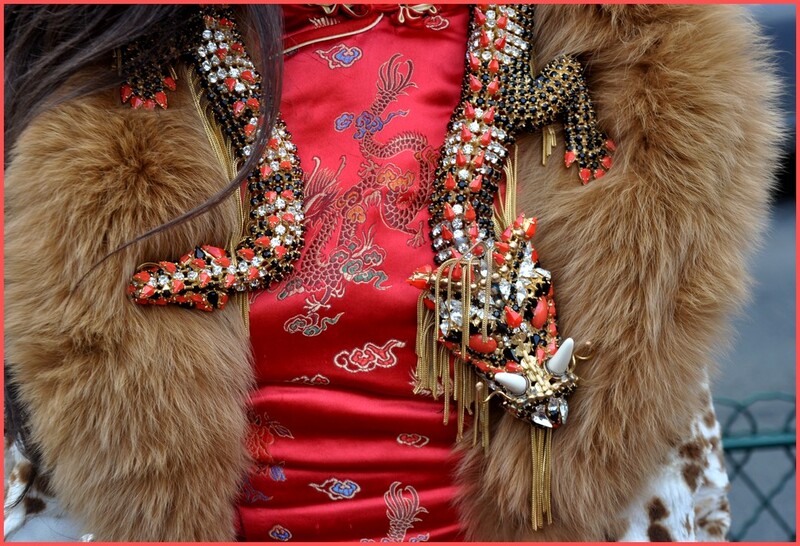 Here are more pictures of our Hanna Bernhard Chinese dragon necklace, can't wait to see it on Hanh ! Such an awesome beautiful dragon necklace!!! LUCKY LUCKY HANH to get such an amazing necklace!! !